I love silhouettes but don’t really have a true one. This is as close as I can get. 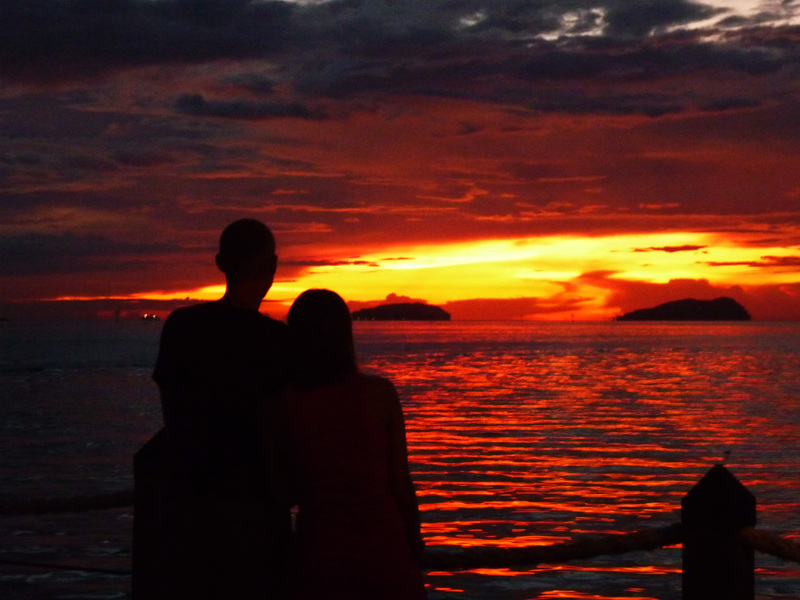 A picture of my friends taken in Kota Kinabalu looking towards Tunku Abdul Rahman Park islands. There will be more to see over at Ailsa’s place, http://wheresmybackpack.com/2012/08/24/silhouette/ her own are superb. Very nice Gilly! And a beautiful sunset too! amazing photo, so well composed and the colour is incredible! Absolutely gorgeous and soooo romantic, Gilly. Well done! a romantic feeling. This would be a great cover on a romance novel, Gilly. I think it fits the chellenge beautifully. Beautiful! A picture that we all find ourselves when in a similar surroundings. Moments of love , joy and peace. Wow, not only did you get a great silhouette but an awesome sunset! Love how fiery red it is! Great job! Gorgeous – I love the red in the sky and on the water. This picture is not only very beautiful but also perfect for the theme.